Ever heard of a nefarious, amorphous gelatinous mass with a seemingly insatiable appetite, ingesting and digesting anything and everything it comes in contact with? It’s The Blob, right?! 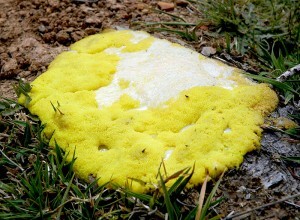 Well, as close as you can get and still operate within real-life parameters…the real blob of which I speak is most commonly known as a slime mold! Now, its name is slightly misleading as it is actually not a mold at all. True slime molds form a plasmodium, a big blob with one membrane and lots and lots (think millions) of diploid nuclei – it is really like one huge cell the size of a medium pizza, a pizza whose many nuclei all divide at the same time. No need to run in terror though, this blob’s top speed is around one millimeter per hour. What is most interesting about these true plasmodial slime molds is that they USED to be lumped in with all of the molds and fungus in Kingdom Fungi. But, because of their unique characteristics – such as the fact that they have a motile stage of life – they are now more commonly associated with Kingdom Protista! Other members of this kingdom are giant sea kelp and amoeba, just to name a few. This kingdom is a sort of island of misfit toys; most organisms belonging here do so because they do not qualify as animals, plants, or fungi and are not bacteria. 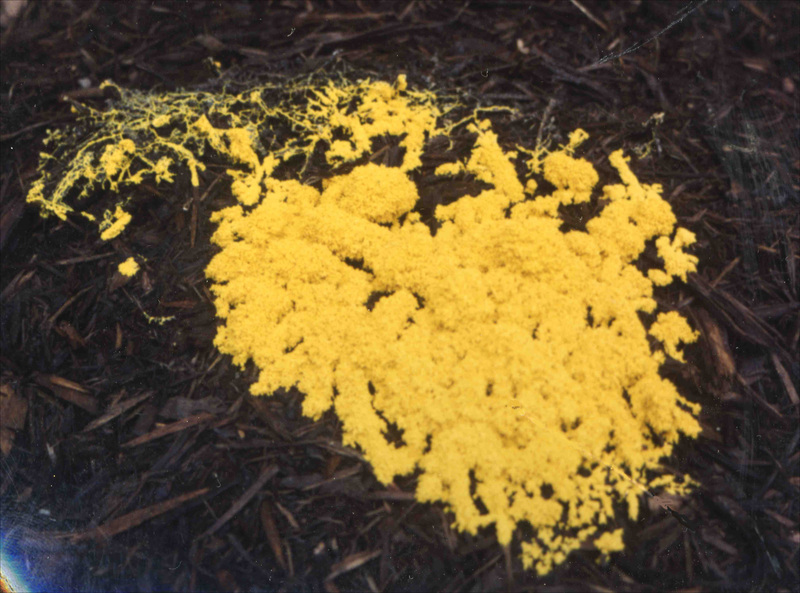 The most common image evoked when ‘slime mold’ is mentioned is that of Physarum polycephalum, a large yellow amoeboid mass on mulch or leaf litter, oozing along looking for bacteria to ingest. Slime molds do, however, come in a variety of sizes and colors. Some slime molds found in the tropics are even bioluminescent! Who wouldn’t want some glow-in-the-dark ooze? I know I do. But, kids, the fun must end sometime. As our blobby buddy matures, it turns into a grey, dust like material and grows spore bearing structures; many look like little balls or popsicles on the end of thin stalks and can vary in color – they even come in pink! When the spores are eventually released, they settle in new locations, starting the whole process of ooze and growth all over again. Isn’t life amazing? The biggest one I’ve ever seen was about 6 inches across but it was moving about 2 inches an hour, maybe three. It was dull orange color and about as hard as orange peel, maybe that was it’s last gasp. Icouldn’t find a sign of it the next day. thank you so much for the funny and informative article. as a science teacher, I doubly appreciated your knowledge and entertaining way of sharing it. i found two 6 inchers on my mulch pile this evening and i now know what species they are, thanks to your article and excellent photo. Next Post Get your hands on science!